Are you looking forward to watching the 2014 Winter Olympics in Russia this year? I am, and the countdown is on with less than a week until the Opening Ceremony! Because I love to ski, I really enjoy the downhill skiing events. It’s exhilarating to see skiers achieve speeds beyond 80mph! Another Olympic event that I find intriguing is Painting. Yes, Painting! The Modern Olympics were founded on the premise of blending sport with culture and education and therefore between 1912 and 1948, Olympic Artist’s competed for gold, silver and bronze medals. All works had to be inspired by sport and had to be originals painted specifically for the Olympics. This phase in the Olympics’ history didn’t last long because apparently professional artists were not allowed to compete which excluded a large segment of talented artists. Eventually it became difficult to determine the amateur status of artists and the whole thing was given up. The International Olympic Committee (IOC) did however, beginning in 2000, re-launch an Olympic Sport & Art contest that occurs every four years! I believe in the life-enhancing value of art and admire both the original premise of the Olympics and the IOC’s continual dedication to keep it alive. I have actually been fortunate enough to be involved with the Olympics through art. I can’t say that I’ve been an Olympic winner (though that would be amazing), however I was commissioned by The U.S. 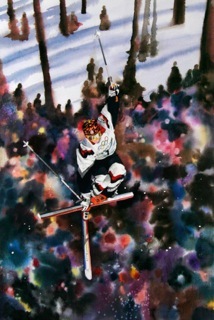 Ski & Snowboard Team to create original watercolor paintings of gold medal skiers Picabo Street and Jonny Moseley. Each painting was reproduced into a limited edition and signed by the Olympic champions! This is a fun memory for me.